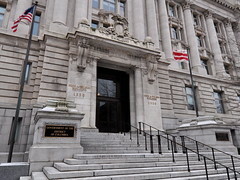 Starting in 2014, DC voters will elect the attorney general to go along with the Mayor. Currently, the position is appointed, which was the subject of a recent poll by the Post. 55% of those questioned said the AG’s position should be elected and not appointed. The mayor is less than thrilled by the proposition, the Post says, citing the fact that the Mayor would now have to hire his own attorneys going forward. He could veto the bill, which would require 9 council votes to overturn. The initial bill, passing 12-1, heads to his desk and thence to Congress for approval. Any idea if Jason Chaffetz (R-UT) wants to stick his nose in this? Why not give him a call at (202) 225-7751 and ask?